For the coming Mid-Autumn festival, there is plenty to look forward at Le Mei, Le Meridien Putrajaya. The culinary team led by Chinese Executive Chef Michael Wong is showcasing a new Dim Sum menu and this year’s Mid-Autumn Mooncake collection. Starting August, diners are in for a sumptuous dim sum treat. Tuck into modern and exquisite dainty morsels of delight by Chef Wong and his culinary team at Le Mei. Chef Wong recreates traditional flavours for the modern palate with handcrafted dim sum using fresh locally and internationally sourced produce. A classic of Chicken & Shrimp Dumplings Siew Mai is a delight. Plump and bouncy textures with tasty notes of sweet fresh shrimp is near perfection on the palate. Crustacean lovers will rejoice at sight of Steamed Fresh Shrimp with Spinach Dumplings and Green Pea Phoenix Shrimp with Ebiko. Both succulent and sublime, the dumplings are delicious in every bite. The Steamed Scallop with Baby Abalone Dumplings, a luxurious one indeed, filled the taste sense with a pleasure of satisfaction. Thin crystal skin encasing sweet cubes of scallop, prawn and crowned with baby abalone for extra lux elevated dim sum dining to the finest. Unusual to dim sum, the Squid Ink Dumplings with Sea Urchin, Asparagus & Prawn proved that some creations do pay off. Moreish with a touch of unctuous note of squid ink and sea urchin, the dumpling is remarkably yummy in flavour and texture. For fried dim sum, the pretty Almond-coated Golden Prawn Balls with Parmesan Cheese is just as good as it looks. Bouncy prawn balls with a crispy and nutty layer encases a cheesy element. Both Crispy Dried Cod Fish Fillet with Fresh Prawns and Black Sesame Cigar Rolls are also stunning and unusual. Each one has the essential element of crispy and juicy notes that made them delicious and easy to enjoy. Besides dim sum, we also tried Braised Fish Maw with Crab Meat, Wok-Fried Asparagus & Fresh Prawns with Extraordinary Sauce and Stir-Fried Noodles with Shredded Chicken in Supreme Soya Sauce from the regular Chinese menu. The Wok-Fried Asparagus & Fresh Prawns with Extraordinary Sauce was exceptionally superb in flavours and the prawns were super fresh and sweet. The Stir-Fried Noodles had a luscious breath off wok aroma and was a crowd pleaser for many. Le Mei dim sum is available from 12noon to 2.30pm daily on weekdays. For a Sunday treat, there is a dim sum buffet at Le Mei from 11am to 2.30pm priced at 138nett per adult and RM69nett for children. Le Mei is halal ad the restaurant seats up to 90 diners in the main dining room and 68 diners in the five private dining rooms. Dim sum menu is available here. For Mid-Autumn treat, savor finely curated mooncakes presented in auspicious and beautiful gift boxes. Eight varieties of hand-crafted baked and snow skin mooncakes are the highlights of this year’s Mid-Autumn collection. 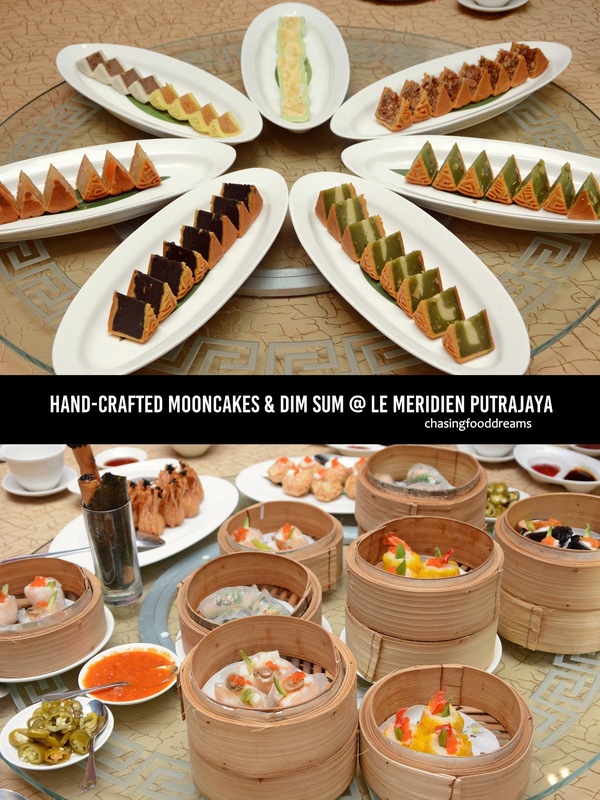 They are all available until 24 September at Le Meridien Putrajaya. For minimum purchase of 50 boxes and above one can have your corporate logo as a personalized touch on the mooncake gift box. One week is required for this personalization. Snow skin mooncake highlights the much-beloved King of Fruits with Premium Durian Mini Snowskin for those who simply cannot resist the unctuous flavour and aroma of durian encased in ping pei skin. For creative notes, the Coffee & Raisin Mini Snowskin and Jackfruit & Mango Mini Snowskin will certainly appeal to the adventurous foodies. The Baked mooncake features more classic flavours from White Lotus Paste with Single Egg Yolk and Melon Seed, White Lotus Paste with Walnut & Black Sesame to Pandan Lotus Paste with Hazelnut and Assorted Fruits & Nuts Mooncake. There’s a modern flavour of Green Tea with Cheese & Cashew Nuts Mooncake too. The intense green tea note proved to be quite a well-match for the layer of cheese and nut combo. All mooncakes are hand-crafted by the culinary team at Le Meridien. Chef Wong and his culinary team took on through a mooncake demonstration. Using the finest ingredients and modern technology, all mooncakes are made in-house. The mooncakes are priced from RM18 onwards. There is a 20% discount applicable for purchases with selected credit cards from Maybank, Citibank, CIMB, Hong Leong, HSBC and UOB.